NIKKEI 225 Weekly; Trend line verify; if the market price will go over 9500yen, we think the market price will jump. We can hear see some bullish analysis “Now going 10000yen!” but we are still bearish. We do not know the true reason why NIKKEI 225 is sinking on but there exist enough reason. 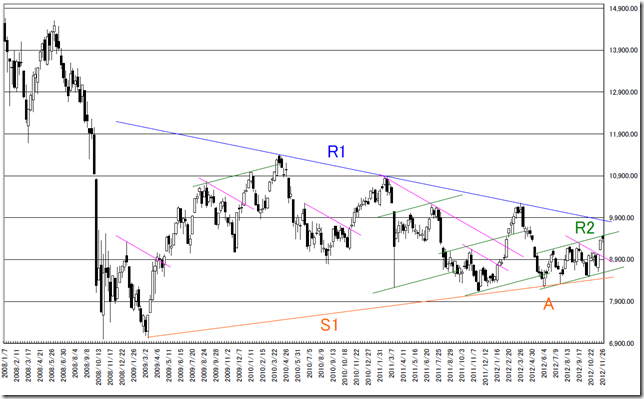 If NIKKEI 225 will jump, the chart will tell us enough reason; there will be no need to worry about. We add some trend lines on the chart. 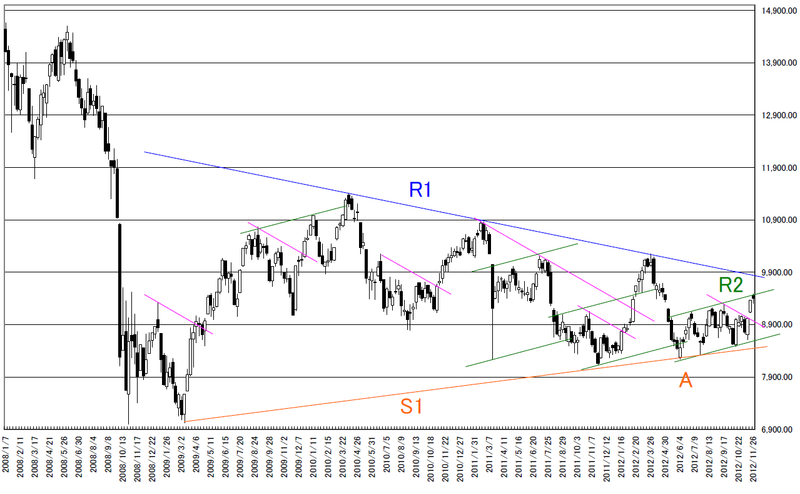 The resistance (R1) is 9800yen around and the support (S1) is 8600yen around and we reported theses facts in 10/01/2012. At “A” point, the trend line was re-written to down side; this often suggests bearish. And we add same degree resistance (Pink color) and support (Green color) lines on the chart. We can see many same degree resistance and support lines. The market prices run into Green channel band and went upper side limit. If the market price will cut “R2” resistance, the market price will challenge “R1” resistance. The limit of “R2” resistance is 9500 yen around. We think it is not too late to change our view as bullish when the market price will cut “R1” and will make a dip. NY GOLD; Trend line verify; if the market price will cut 1700point, the market trend may change. Today’s analyze is NY GOLD daily. Last day fall was big and we became nervous and we need to determine the trend changing point. We can see 1713 point around work as strong resistance in these days. 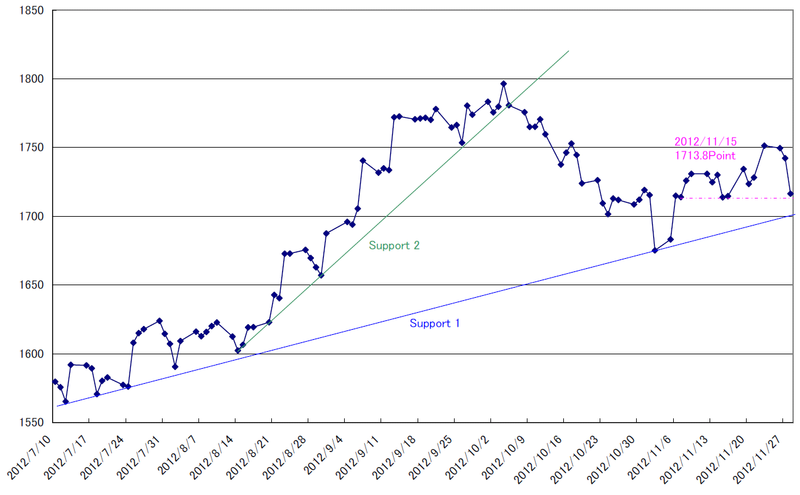 “Support 1” is the line from July and if cutting it, we can may trend changing. 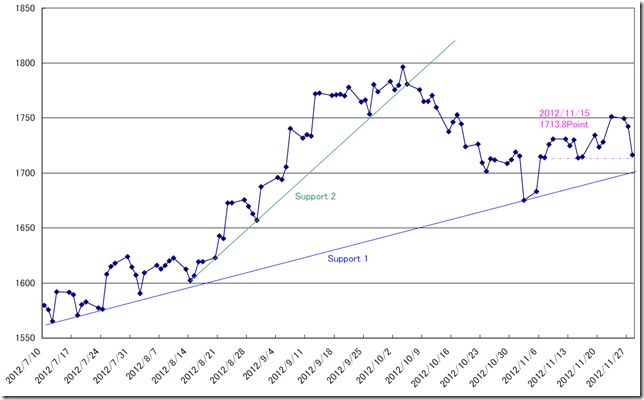 The recent “Support 1” exists 1700 point around. If cutting it, steadiness or falling will start.